Love caramel? 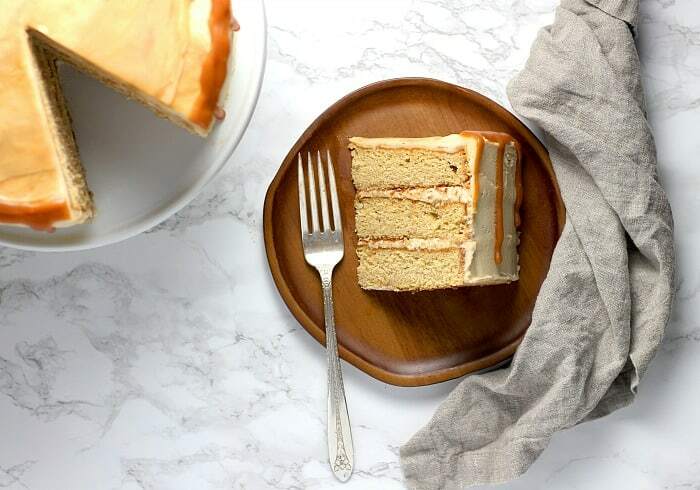 You’re going to ADORE this recipe…layers of brown sugar cake filled and topped with caramel frosting and a drizzle of fresh caramel and fleur de sel make this Salted Caramel Layer Cake a decadent, delicious, and almost sinful dessert! So before I get to the recipe, let me tell you a lovely story. My best friend here in Germany is PCSing (Permanent Change of Station) back to the United States this week. When I arrived in Germany back in March 2011, Chrissy was the first friend I made. I was given her phone number by my husband’s company FRL (Family Readiness Liaison) and called her for some advice on how to adjust to life in Germany. We were instant friends. It wasn’t long before we were having coffee, going to lunches, and volunteering together in the community. Oh…and I baked for Chrissy and her family. A lot. Chrissy, her husband Jody, and their two boys Evan and Braden were always the guinea pigs when it came to new recipes and taste-testing. Countless times either of our kids were running across the street (‘cause we only lived a block away from each other) to deliver or pick up baked goods. I’ve made birthday cakes for both her kids, for her husband (Blue Ombre Layer Cake) and for many other celebrations. I’m certain they collectively gained 20lbs during the two years we’ve been friends. And today…I have baked a Salted Caramel Cake to enjoy with, and say goodbye to, my best friend. Layers of brown sugar cake soaked with salted caramel sauce…filled with caramel frosting and topped with more salted caramel. I spent the afternoon relaxing with Chrissy and her family at my house – really, it couldn’t have been better. We ordered pizza, drank wine, chatted, relaxed in the sunshine of my backyard. The men smoked Cuban cigars. The kids played with friends down the street. Bitter-sweet. But a perfect ending to a wonderful chapter in our lives together. I know today won’t be the last time I see Chrissy. Someday, we’ll be together again. So…until then, I’ll keep baking…keep sharing what I bake with new friends…and always hold on to the love and joy I shared with Chrissy here in Germany. 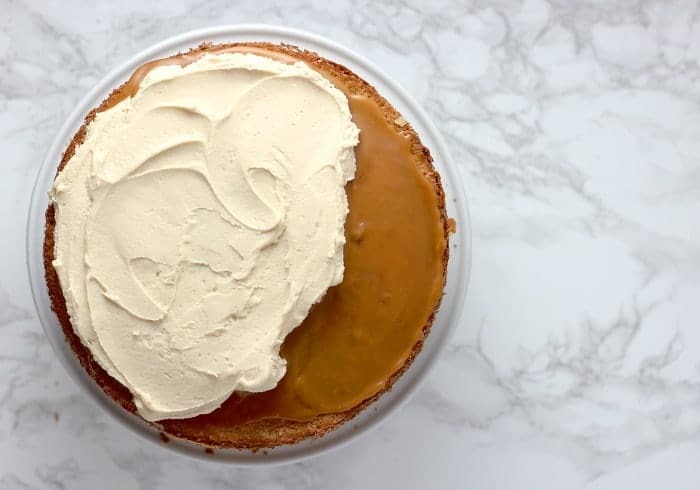 Hopefully, that same love and joy will inspire you when you make (and devour) this Salted Caramel Cake. There’s kind-of a lot to take in here, but please, trust me, it’s SOOO worth it. Again, there’s a lot to do, but you are going to LOVE the result. I promise! Prepare 3 8-inch cake pans by buttering them, lining them with parchment paper, and flouring them. In the bowl of your stand mixer, cream together the butter and sugars for about 3 minutes. Add the eggs one at a time and mix until incorporated. Scrape the sides of the bowl often. Add the flour and buttermilk, alternating until combined. In a measuring glass, mix together the baking soda and vinegar then add to the batter. Mix just until incorporated. Do not overmix! Separate batter evenly into the three prepared cake pans. Bake about 20 minutes or until the top and edges are golden brown and a toothpick comes out clean. Cool in pans for 5 minutes before removing to a wire rack to cool completely. In a very large, heavy saucepan or pot over medium-high heat, pour the sugar in an even layer over the bottom of the pan. Whisk until melted. The sugar will clump up but will eventually completely melt. This will take about 4-5 minutes. Add all the butter and whisk until combined. This mixture will bubble up, but keep whisking until all the butter has melted. Slowly pour the heavy cream into the mixture and whisk until incorporated. Stir in the fleur de sel. Cool for about 10-15 minutes before using. Store leftovers in a jar with a lid and reheat before using again. Refrigerate up to 2 weeks. In a medium, heavy pot, whisk together the brown sugar and 2oz of butter over medium heat until melted. Bring to a boil for no more than 10 seconds. Remove from heat immediately and pour in the heavy cream and whisk until smooth. Cool to room temperature. NOTE: You can use an ice bath and whisk to cool quickly if you don’t have time to wait. In the bowl of your stand mixer, cream together the remaining 3oz of butter and cream cheese until smooth. Scrape the sides of the bowl several times during this process. Turn the mixer to low and pour in a slow, steady stream the brown sugar mixture. Scrape the sides of the bowl and mix on medium speed until completely smooth and incorporated. Add the sifted powdered sugar and mix on medium speed until smooth. The frosting will feel very soft, so refrigerate it for 10-15 minutes to harden it before frosting the cake. Once the cake has cooled, use a large skewer to poke holes across the top of the cake. Spoon a layer of caramel sauce over the top of the cake and use an offset spatula to spread it evenly. Allow the caramel sauce to soak into the cake. Repeat this process with a second layer of sauce. Once all the caramel has soaked into the cake, place one layer of the cake onto your serving platter. Spread a thin layer of frosting over the top of the layer – no more than 1/2 a cup of frosting. Place the second layer on top and spread another thin layer of frosting. Place the final layer of cake on top and frost the outside of the cake with the remaining frosting. Drizzle the top of the cake with caramel sauce. 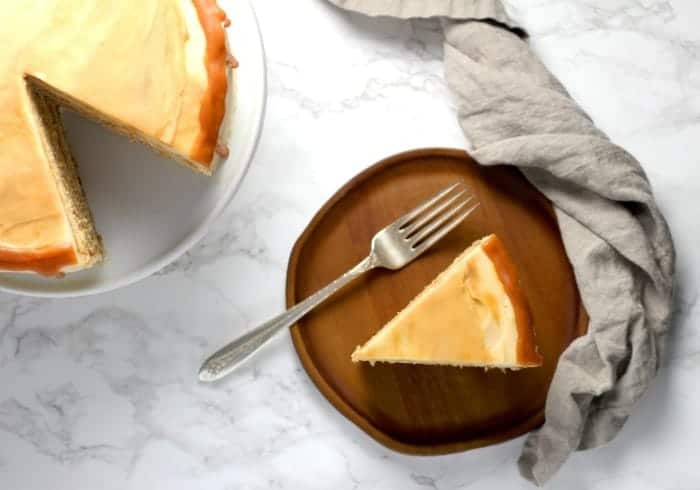 Using a spatula, in a back and forth pattern, spread the frosting and sauce together until it is incorporated and it looks like the caramel is oozing thru the top of the cake. Using a disposable piping bag and a very small tip, fill the bag with caramel sauce. Pipe a layer of sauce around the top edge of the cake, stopping every inch or so to squeeze a little more so it drizzles down the side. Sprinkle with fleur de sel. Refrigerate until ready to eat, but remove 15 minutes before serving. For more detailed instructions on how to make the caramel sauce, visit Brown Eyed Baker. She’s got a great step-by-step tutorial with lots of pictures! Also, the cake and frosting recipes are originally from Laura’s Sweet Spot. 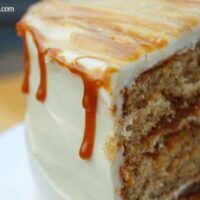 A lot of you have made this caramel cake recipe and I wanted to share a few points of feedback that may help future bakers make it successfully! The sauce recipe makes more than you actually need for this cake, probably by half. But the reason why I left this amount in the recipe was because that’s how I made it the first time I baked this cake! If you don’t want leftover caramel sauce (but let’s be real here, who doesn’t want leftover caramel sauce) you could halve the recipe and still have enough. Because the caramel frosting is made with cream cheese, it is VERY SOFT. If you live in a hot place, consider keeping this cake cool until serving. Also, the softness of the frosting could make it difficult to apply to the cake layers. To ensure it’s creamy, but not runny start by adding less a tablespoon at a time until you get a smooth consistency that’s not too soft. Finally – this cake is SO GOOD you may be known as the BEST BAKER EVER after you make it. So many of you have commented that your friends and family were incredibly impressed after you baked this cake. That makes me so proud! Happy baking, my sweet friends! Leave a comment below with your results or your questions. I’d be happy to help you…or just to hear your stories with this recipe! Layers of brown sugar cake filled and topped with caramel frosting and a drizzle of fresh caramel & fleur de sel make this Salted Caramel Layer Cake a decadent, delicious and almost sinful dessert! Prepare 3 8in cake pans by buttering, lining with parchment paper and flouring. Add the eggs, one at a time and mix until incorporated. Scrape the sides of the bowl often. Add the flour and buttermilk alternating until just combined. Once the sugar has melted, stop whisking and cook until the sugar has turned into an amber color and has a nutty aroma. Remove from the heat. In a medium, heavy pot, whisk together the brown sugar and 2oz of butter over medium heat until melted. Bring to a boil for no more than 10 seconds. Remove from heat immediately and pour in the heavy cream and whisk until smooth. Cool to room temperature. NOTE: You can use an ice bath and whisk to cool quickly if you don't have time to wait. The frosting will feel very soft - so refrigerate it for 10-15 minutes before frosting the cake. Once the cakes cooled, use a large skewer to poke holes across the top of the cake. Spoon a layer of caramel sauce over the top of the cake and use an offset spatula to spread it evenly. Spread a thin layer of frosting over the top of the layer - no more than 1/2 a cup of frosting. 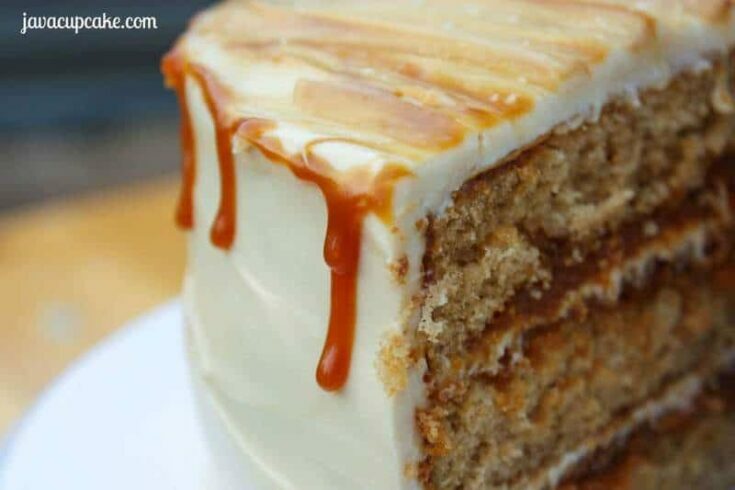 Drizzle the top of the cake with caramel sauce. 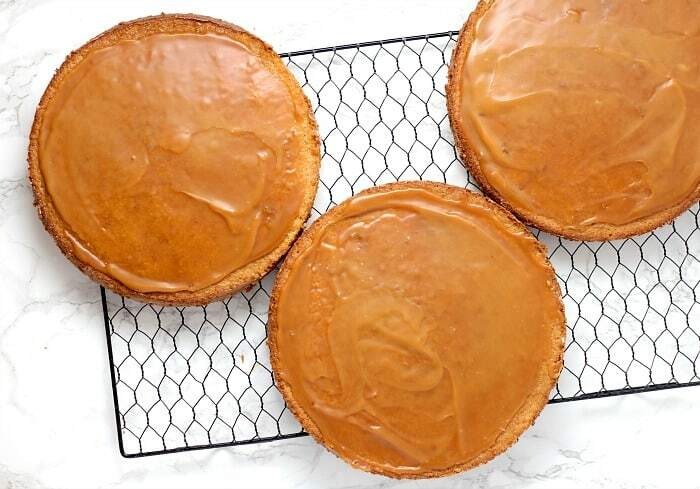 Using a spatula, in a back and forth pattern, spread the frosting and sauce together until just incorporated and it looks like the caramel is oozing thru the top of the cake. Refrigerate until ready to eat - but remove 15 minutes before serving. For more detailed instructions on how to make the caramel sauce, visit Brown Eyed Baker . She's got a great step-by-step tutorial with lots of pictures! Um hello this cake is amazing. What a lucky friend you have! Such a nice thing to share baking with friends, especially someone who lives so close!! This is regarding the salted carmel layer cake. I am dyin over how delicious this looks! I so love caramel! I assume that this cake bakes at 350 degrees, but I couldn’t find the temp listed in the recipe. Am I right? Oops! Thanks for catching my omission! Yes, 350 F degrees! Did it turn out? Oh my gosh! It is super-delicious! It is so rich and tasty by not teeth numbingly sweet. It’s the perfect birthday cake! I made this for my Mom’s birthday last night and it was a huge hit!! Everyone loved it. Thanks for the great recipe! Yay! So glad you loved it!!! 🙂 xoxo Happy Birthday Mom! Hi Betsy! This cake looks absolutely delicious! I would like to make it this weekend for my sons’ baptism, but I’m not too experienced with making cakes, especially layered ones! I am wondering, how many servings does this make? Thanks. Ooohh.. you could easily 20 servings…. maybe even 25-30 depending on how thin you cut the cake. Since it’s three layers of cake and frosting, big slices really aren’t necessary!! 🙂 Let me know how it turns out for you! Hi I wonder if I can add three milk on the cake like a three milk cake after I have done the caramel sauce? I’m sorry your friends had to move so far away, but at least you got to know them for awhile. I’m sure you will see them again 🙂 And this cake – I don’t even have words for how good it looks! I hope I get to see them again. The Army is small… but the world is big! 🙂 Happy Baking! I made the cake to direction and everything turned out wonderful except the caramel sauce. I had to use a store bought since I ran out of time and ingredients. Mine tasted awful and burnt even though I used the candy thermometer and followed the specifics to a tee. 🙁 Sad. Oh that’s a bummer, Lisa. I know I’m not good at making the caramel sauce either. Practice makes perfect for me. Anything that is made with a candy thermometer is usually not my best work. Hopefully next time you’ll try it again and it’ll turn out better for you! Good luck and happy baking! This might help … when I made my caramel I took it off the heat a little before it reached 350 degrees ‘cos it was brown enough – and it would continue cooking a little longer until I got the butter in and started cooling it down. It seems to have worked out all right ‘cos my testers thought it was good. Hi, I’m from the UK and I’m about to try your recipe. Just wondering whether the sugar you use for the cake and caramel sauce is just normal sugar (granulated) or caster sugar (super fine)? Let me know asap please and thanks! I always use normal, granulated sugar! 🙂 Happy Baking! I made this last fall for friends because I am a huge salted caramel fan and it was a hit! My friends raved about it. I saved a slice and froze it for a rainy day, which ended up being last weekend. It was as delicious as I remembered it. Thanks for sharing your recipe! Oh that’s great to hear that the cake froze well! 🙂 It makes me so happy to hear how much you enjoyed it! YAY! Thanks for the note! This is the most beautiful cake I’ve ever made… loved all your directions on how to “decorate” it! I made it for my mother’s birthday tomorrow, but I’m a bit nervous because the caramel sauce had a burnt taste to it. How can I avoid that next time? I have a hard time with the caramel sauce burning too…. really watch the temperature. If you have any doubts, cook it slightly less next time. Or… if you’re like me, use caramel sauce from a jar! 🙂 hehe I’m really not that great at making caramel! Haha! Sounds good! I really loved the whole cake, and I so wanted to try it again… I’ll just cook it less (and have some in a jar as a back up)! But again, I love all your detailed instructions! That’s what made me choose this recipe as I am a bit of an amateur! Thanks so much for sharing! Hi Betsy! I love salted caramel, so I really look forward to trying this cake! We have a lot in common. I am an Army wife living in Bavaria, Germany, too. I love to bake and share my goodies with my friends. I am so glad to have found your website. It will get me through my husbands deployment! Hi, I would love to bake this this weekend for a friends birthday..But was just wondering…does the frosting come out even .i mean can i frost it like a perfect buttercream/ganache?? It frosts nicely. I don’t know if perfectly…. because really, nothing is ever perfect and I don’t know your frosting skills! 🙂 Good luck! Does the top layer of the cake not get the salted caramel sauce poured over it? Thanks! This cake looks amazing and I’m going to make it for my girlfriends birthday. I’m im Australia, just wondering if the flour is SR or plain (all purpose flour)? I’m assuming all purpose given it’s got vinegar and baking powder in it?? Can’t wait to taste this cake. I have to say, I don’t believe I’ve ever seen a recipe that refers to butter measurements in ounces. Thought that was odd. I live in Germany – so a lot of my recipes have some measurements in metric. It’s actually much more accurate than to measure in weight than volume. Luckily, most butter packages tell you how much each stick weighs so it should be easy to manage. 🙂 Hope the cake turns out well for you! May I ask, can i use cake flour, that’s what I bought?? Many thanks! Thanks for your reply! I’m going to make this for a friend of mine, it’s his birthday, but he’s from the south, i mean the southern US, do you think the cream cheese frosting deviates a lot from the “traditional” caramel cake he’s probably talking about when he says he likes it?? He’s been to every fancy restaurant in the world it seems, so my hands are full in this endeavor! thanks again! There’s nothing traditional about this cake! hhehe 🙂 And to be honest, I’m not sure I know the “traditional” caramel cake he’s referring to. I’d never had a caramel cake before I made this one. BUT… Everyone who has made this LOVES it! 🙂 Happy Baking! Oh yay! So glad to hear how much you loved the cake!! 🙂 xoxoxo Thanks for letting me know! Am in the midst of making this wonderful yummy licious looking cake!The cake the salted caramel syrup turned out PERFECT but….my frosting is way toooo runny. It has been in the fridge for an hour now and am still not getting the consistency am looking for thus it’s hard to frost onto the cake. 🙁 Any idea where or how i could fix it?? Try adding a couple tablespoons of shortening to the frosting and keep it chilled. Cream cheese frosting is so difficult to work with sometimes because if it’s too hot, humid or if you add too much sugar or liquid to the frosting, it gets too soft to work with. I hope this helps! 🙂 Good luck! I’d say it’ll be good in the fridge for a few weeks! 🙂 Did you take any pictures? I’d love to see your cake!! Hope that you can view the lovely cake..Thanks again Betsy! Going to try your other recipes!..wohoooooo!! Nur! How amazing! The cake looks super delicious! How long would you say you can keep this cake in the fridge for after putting the frosting on? Looks amazing, can’t wait to try and make this! Fabulous Meggan! And you’re right… it’s a lot of work, but it’s soooooo worth it!! Happy Birthday, Dad! I made it for my daughter’s birthday. it’s good but it’s too sweet for me. probably if I’m going to make it again, i’ll lessen the sugar specially for the frosting. Hi! I just found your recipe for this amazing looking cake. My husband’s birthday is coming up and he LOVES salted caramel anything so this cake looks perfect! 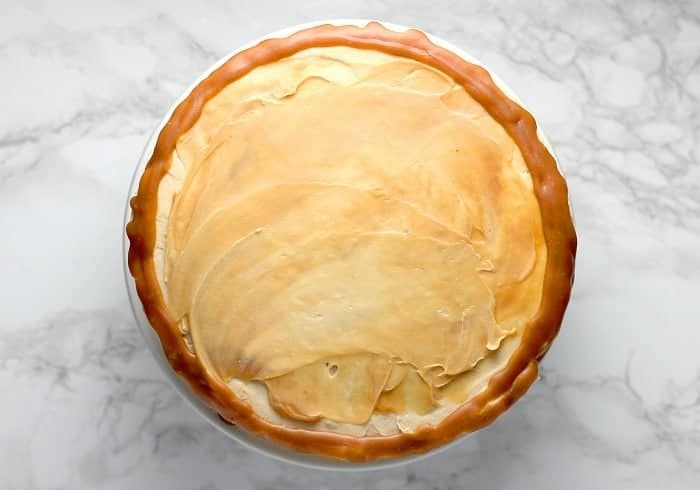 I do have one question pertaining to the assembly section – you indicated poking holes across the top of the cake, letting that soak in and then adding another layer. Then it moves into the assembly of the three layers and adding frosting on each. My question is do you do the hole poking/adding caramel sauce on all three layers letting it soak in before putting the cake together with the frosting? I am so excited to try this cake! Hi Ila – Great question. Just poke holes with the sauce on the bottom two layers. Poking the holes and letting the sauce ooze into those two layers add as an extra filling for the cake. It’s sooo yummo! 🙂 Happy Baking! Hi! I made the cake portion yesterday and it didn’t rise. At all..was more like a really dense pancake. So, I thought maybe I overmixed it or something and retried last night. Same result. Barely rose… 🙁 I went ahead and just cobbled it together, doused it in caramel sauce (which turned out amazing) and frosted it. Any tips on why maybe the cake didn’t rise? I’m in Los Angeles at sea level, so wasn’t sure if I needed to adjust the amount of baking soda, perhaps? I brought the leftovers into work this morning and people still freaked out over it, but I wonder what it would taste like if it had risen more. Instead, the cake portion tasted more like cornbread…hmmm. I made that cake tonight,and it was amazingly delicious)))Thank you so much for your recipe!!! I made this today for my sister-in-law’s birthday cake, and it was a hit! I used a 7in tin (3 times because I only have the one! ), and I only ended up using 2 tiers. I used 2tsp of Dead Sea salt in the caramel, and I left the sides un-iced. It was loved by all! The birthday girl took the leftover caramel sauce home for ice cream lol. Wonderful Mandi!! I’m so glad it was loved by all! Did you take a picture? I’d love to see it! Sorry it’s taken my ages to reply! I had to track down the pictures, I didn’t take them lol. Is there a way of adding them to the comments feed? For over 30 years my daughter has requested a strawberry short cake for her birthday. This year she wanted a caramel layer cake and I came across this recipe. It was positively divine! I could literally eat the caramel sauce by the spoonful! It was that good! It is a bit time consuming but was well worth it! Thank you so much for the recipe–this one’s a keeper! That makes me so happy to hear Marguerite! xxoo And you’re right… it takes a bit of time, but like a friend reminded me of today… nothing good ever comes easy! Happy Birthday to your daughter! im going to attempt to make your spectacular cake gluten free just wondering if any of your fan base have tried this…? I haven’t heard of anyone trying it GF. Let me know how it turns out! This cake looks amazing and I can’t wait to try it. Planning to make it this weekend for my friend’s birthday. I have a question though. I have 3 9 inches cake pans instead of 8 inches. Do you think I should make changes to the recipe or go ahead as it is. You shouldn’t have to worry about altering the recipe, but I’d just watch the baking time, it may take a little less since the pans are bigger. Happy Baking! I know it’s been long since I messaged but I kept forgetting to send you the picture. I tested out your recipe on my sister for a celebration for their last exams and everyone really enjoyed it. I was wondering if I was to make the base of this cake in cupcakes how many do you think it would make? Probably 2-3 dozen cupcakes. Not sure though… haven’t tried it as cupcakes! what a beautiful cake that is, and it sounds awesome too………… I just wondering, is the recipe enough to make a 11×15 sheet cake? 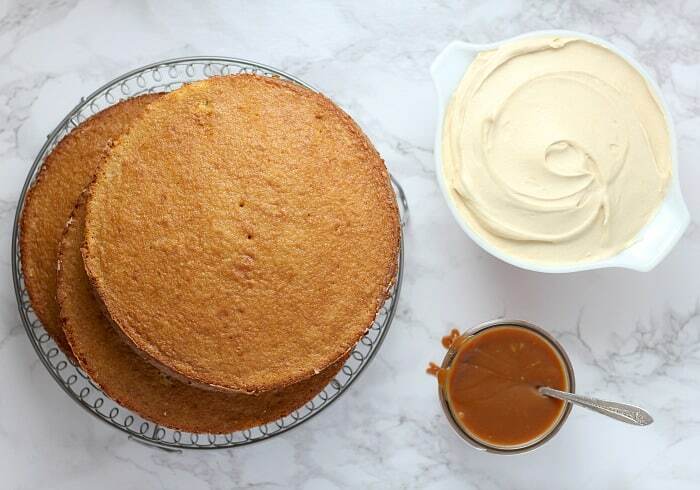 I was asked to make a caramel cake and this recipe fits the bill…. Absolutely amazing cake. I just want to say: Don’t be afraid to make your own caramel sauce! It is really not hard, but I do a couple of things differently than Betsy. First, she says to “whisk” the sugar. I use a wooden spoon and just stir and stir and stir until the sugar is liquid. Also, she says it takes 4-5 minutes, but I think it can take a lot longer. Just keep stirring. It will happen. Next, when she says “heavy” saucepan she means heavy! I have very good success with Le Creuset, so if you have something that heavy, use it. Finally, I think it should always be pointed out when discussing melting sugar that this is NOT an activity in which children should participate. Melted sugar is probably the hottest food substance known to man and if it sticks to your skin … it’s horrible. So take care and also realize that it doesn’t cool down quickly. The first time I made caramel sauce, I tried to lick the wooden spoon a few minutes afterward, when the sugar had already hardened on the spoon. I learned a hard lesson because it was still ridiculously hot. All that said – it is so worth making your own. It is not hard, it is delicious, and it is impressive! Thanks for a fabulous recipe, Betsy – I will be making this again and again. Made this today for my son’s 18th bday. He loves salted caramel anything. I thought it was a weird recipe. To have butter measured in three different ways for the three different components of the cake was frustrating (cups in cake itself, Tbsps in sauce and oz in frosting??) It was a lengthy process overall, which I could tell from reading the recipe. I’m fine with that if the end product is spectacular, but no one loved this cake. The icing is really weird and thin, even after the recommended refrigeration. And the icing is waaaaaaay to sweet. Pretty disappointing. I thought it would be amazing. I’m sorry you found the recipe so disappointing. You are right… there’s a lot that goes into making this cake, very labor intense! I updated the recipe so that the butter measurements aren’t so confusing. Hope it helps! I was wondering if the cake portion could be made ahead and frozen? I typically make ahead and freeze (unfrosted) cakes, wasn’t sure about the caramel aspect and freezing…thoughts? Hi Janet. Yes, absolutely you can make the cake ahead of time then freeze. I would suggest however setting the cakes out about 20 minutes before you plan to frost them so that they have time to thaw a bit. Cake that is frozen then frosted tends to sweat later and ruin the frosting and that’s no good! I am dying to make this cake as it looks amazing! But are you able to let em know the exact measurements rather than ‘cups’ or the amount of brown sugar, where it says “3/4 firmly packed”. You can find the conversions for the measurements here: https://javacupcake.com/2014/11/baking-conversion-charts/ Happy Baking! Hi, I was going to make my own buttermilk with milk and vinegar but I noticed that you add a tablespoon of vinegar as well. Has anyone tried this? I’m worried the cake will taste vinegary. I make my own buttermilk also and I’ve never had an issue with the cake tasting like vinegar. It really only acts as a reactor to the leavening agents in the cake. 🙂 Happy baking! Thanks Betsy! Planning on making this for my mom for her birthday! She LOVES caramel! Fingers crossed I don’t screw it up! Under the Caramel Frosting ingredients, 5 oz butter would actually be 10 tablespoons. 1 T butter= 0.5 oz. Just wanted to let your know so people don’t use the wrong amount! Yes, the frosting is very loose… it’s definitely not an easy frosting to master. I wish I could have made an easier one for you!! So sorry! Made this for Christmas and OMG was it a hit!!! My college friend is a chef and was in town so I asked her to take a stab at the recipe and this cake had everyone feeling the spirit. I will most certainly be making this again!!! Not very happy right now. Chose this for someone’s birthday my mother is going to tomorrow, and will probably need to send her with a store bought cake, though I’m not sure anyone will have caramel. If I tried it again, I might be able to tweak things and figure out how to make it work, but unfortunately there isn’t time on this one. As another commenter experienced, mine didn’t rise much, and each layer only came to about the halfway point on the round cake pans. Not sure how much was the lack of rise, or the amount of batter. Maybe bumping up the quantity on the batter ingredients would have gotten me closer. The frosting was also way too runny as someone else mentioned. I left it in the fridge for a while before using it, and it looked fine in there, but within just a few minutes of room temp, it got really gummy and drippy. To make matters worse, the cake itself was a bit dense and gummy, so if I wasn’t careful, it would glue itself to the cake and lift big chunks up as I spread it. I’m sure a good part of this was error on my part, and a more experienced baker would have seen some of it happening and known how to remedy it (or avoid it), but I am typically pretty thorough about following instructions. I hope to maybe try this again when I have more time. I’m sorry the cake didn’t turn out for you like mine did. There are a few things I can think of that may help for you in the future. First, how much did you work the cake batter when you were mixing it? Over mixing causes a tough, sometimes as you described it, gummy texture. Next time, make sure to mix only until the dry ingredients are combined. Also, rise also is determined by hold old your leavening ingredients are and the elevation you live at. If your baking soda was old, it won’t work like it’s supposed to. If you live at a higher altitude, you need to adjust your levels of leavening, sugar and flour if you live at a higher elevation. Your oven temperature may have been a factor as well. If the temperature is off and it’s not hot enough, the batter won’t get a good rise. As for the frosting, remember that it’s a cream cheese based frosting, which means that’s it’s going to be soft to begin with. Next time, I’d suggesting adding half the sugar and half the cream to start. The more sugar/cream added, the softer the frosting will be. And with cream cheese frosting there’s no going back once it’s too soft! If you don’t like the cream cheese, try using a classic buttercream. I hope all these suggestions help if you attempt the cake again. This is a cake with a lot of steps and a lot of ways for it to go wrong. Next time you try a new recipe as a gift or for a party, I’d suggest a trial run of the cake first. That way you can work out all the kinks! I’ll save all the tips, as I’d like to try it again later. On a positive note, it didn’t turn out as bad as I thought (maybe from overnight in the fridge). Everybody apparently loved it, and she’s supposed to be saving the last piece for me. Looking forward to seeing what the inside looked like. I saw some of the stuff you mentioned on the rising part when I looked around online yesterday. I bought a new oven thermometer and will use that as well as a different box of baking soda next time. I also read about the over-mixing and suspect that could have played a big part in it. I’ll try your tips on the frosting too. I’ve had that happen before on carrot cake frosting, and just as you said, I wasn’t able to stiffen it up, even by adding a ton of powdered sugar. Much thanks for all the info. I hope to try it again soon and will try to remember to post back here. I’m curious if this cake can be made in two 9in pans instead of three 8in pans? I only have 2 of either size pans. My husband loves salted caramel and has a birthday coming up, I’d love to make this cake and don’t want to buy an additional pan. The cake looks really good. Yes you can bake it in a 9in pan. I’d suggest checking on the cakes to ensure they do not over bake since the batter covers more surface of the pan in a 9in. Just made this cake tonight for a friend’s birthday party tomorrow. Her only request was that she wanted something with cream cheese icing… I can’t wait to try it! I had a few issues with the caramel sauce, but it was my first time (or rather 2 times) making it. I think with practice, it will be great! Your tips in the recipe were really helpful, I would have panicked when the sugar started lumping before it melts had you not included that description. The salted caramel and the frosting tasted amazing! Hello. The recipe for the Caramel Salted cake will not open. What am I doing wrong? the recipe sounds great but I don’t have most of the ingredients, so is it OK to substitute the heavy cream with whipped cream, the buttermilk milk with milk and vinegar and cream cheese with yogurt? would it taste good? The only thing you can sub with the same result is the buttermilk with milk/vinegar. The rest you really need to keep the same. If you used yogurt instead of cream cheese, you’d get soup. And whipped cream is heavy cream that has been whipped until light and fluffy. So any full fat/thick milk *MIGHT* work similar. I’d maybe suggest a different recipe if you can’t find the ingredients you need. 🙂 Happy baking! Thanks so much, would def recommend this recipe! I was just wondering if you have ever tried making cupcakes with this recipe. I find my family likes cupcakes more than layered cakes. would this be possible? thanks so much! Nope, I’ve never tried cupcakes. However, I’m sure the cake would work as cupcakes. Start baking them for 16-17 minutes, rotate the pan and bake 2-4 more minutes. Let me know if you try it! Just baked this for my boyfriend’s birthday and it was fabulous! Although the frosting didn’t really work for me. It was way too runny even after i refrigerate it so I only use it as a filling and make my own salted caramel buttercream for the outside layer. However, the cake cuts LIKE A DREAM! I would advise to level the cakes first because it could be quite wonky! I am going to make this cake on Sunday for a friend’s Bday. I was considering adding Bourbon to the caramel sauce. This is my first time making a caramel sauce and not sure if there are any adjustments needed to the recipe. Hi, can i frost the cake with latte buttercream instead of cream cheese? I see your site needs some unique content. Writing manually is time consuming, but there is solution for this hard task. Hello! What an amazing recipe, definitely the best Caramel Cake I have come across. Made this as a birthday cake yesterday and it was perfect. As someone has mentioned, the cake layers don”t rise too much but that gives the sponge the right consistency to hold the caramel sauce, it would get soggy otherwise. The cake still has a beautiful height. I didn’t find the icing too runny, just make sure you whip it well and refrigerate for a few hours before using. Thank you, will make this many times over! Planning on making this but only have light brown sugar, can I sub that for the dark brown? I have made this cake several times and it has become a fan favorite. I have a gas stove and haven’t had any issues with the caramel…I confess I do not use a candy thermometer. I have enough caramel sauce for two cakes, which is a blessing. Thanks for Sharing! Yay! So glad you love this cake as much as I do! I’ve baked the layers and after they cooled and soaked up the caramel sauce, I’ve wrapped them in plastic wrap and then foil. I then place in a large zip lock bag and freeze them. I’ve kept them as long as a month, thawed and then iced and served…tasted freshly baked. Delish! How high do you consider high? It is amazing, to say the least. I cut the regular sugar in the cake in half. The icing was a bit challenging but people could not stop talking about it. The brown sugar didn’t completely dissolve so I ended up with a lumpy mixture. So before adding the confectioner’s sugar I strained the mixture and put it back in the blender added the sugar and put it in the fridge. Frosting the cake was easy and it turned out beautiful and delicious. 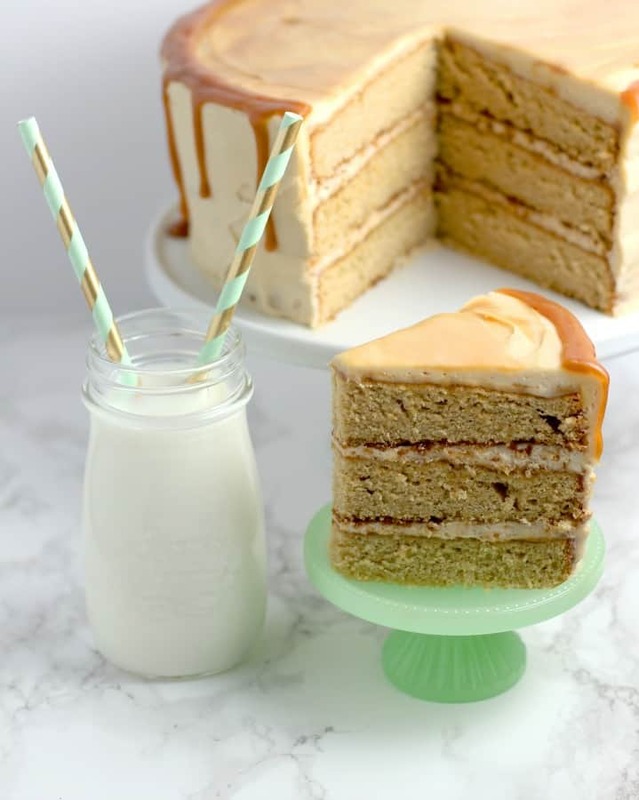 This looks delicious, and I’m in the middle of making it for my Mom… However I’m a bit unsure of which layers of the cake I poke holes in and pour the caramel over… All three, or just the middle one? Thank you! How high are these layers supposed to rise? I have never leavened a cake with a vinegar baking soda mixture. I don’ think I overmixed but these layers did not rise very much and seem rather dense. The baking powder was brand new. I made this for Easter and it was a hit. I followed the directions exactly, except for one tiny thing: used the “wet” sugar method for making the caramel, which meant adding about 1/2 c. water to sugar before heating. Turned out great. That was the only way I’d ever made caramel, and I’ve ruined several batches in the past, so I wanted to use a method I’d used before. The cake is great; mine turned out pretty dense but still great texture and not too sweet, which is a great foil for the icing. I might bake it 1 or 2 minutes less next time, just to see what it’s like. Icing was delicious, and of course, the CARAMEL. This recipe made a lot of caramel. I think you could halve it and be okay, but then you wouldn’t have all that loveliness left over in the fridge. Divine. Thanks for a lovely recipe!! I made this cake a few weeks ago and everyone that tasted it said it was the BEST cake they had EVER had! I bake a lot and these people have tried lots of my cakes, always with great reviews, so that is really saying something! I’m going to visit my daughter this weekend at college and am thinking about making these as cupcakes! My plan is to “fill” the cupcakes with caramel sauce, and then pipe the icing on top. I loved the brown sugar/caramel icing but would like to make a firmer icing (for looks and travel). Do you have any ideas? I have made salted caramel icing before by simply adding a bit of caramel sauce to a half American buttercream/half cream cheese frosting. I may go that route. I would love to hear your thoughts. Thanks for the lovely recipe!!! Hi! I’m so excited to try this… I have a question- sorry if it’s dumb – but do I poke holes and soak all three layers? Or just the one? Don’t wanna overdo or underdo this cake!! All three! 🙂 Good luck and happy baking! How much caramel sauce do you add to the cake layers for the soak? Hi there … about to make this cake and really looking forward to it. Reading the comments I notice a lot of people talk about how runny the icing is. I make cream cheese frosting a lot and actually swap the amounts of butter and cream cheese around – this makes it slightly less runny. The other thing people might be doing is buying own brand cream cheese – it is better to buy a good quality cream cheese. There is something about the chemical reaction of the cheese, butter and icing sugar that makes it really runny if you use the cheaper version of cream cheese … not sure what it is, but having had my frosting refuse to thicken when I used the cheaper version once – never again!!! Thanks for the recipe.